An expansion of the nursing Return to Practice scheme and a 25% increase in the number of nursing undergraduate places are among new measures aimed at addressing the NHS staffing crisis. 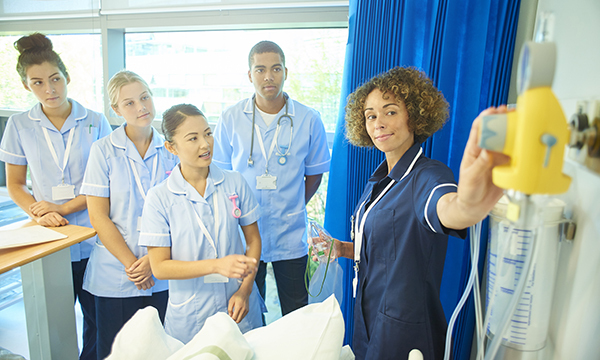 An expansion of the nursing Return to Practice scheme and a 25% increase in the number of nursing undergraduate places are among new measures aimed at addressing the NHS workforce crisis. Health Education England says 'radical action' is needed to boost nurse training and retention. Workforce body Health Education England's (HEE's) Workforce Strategy aims to 'future proof’ the NHS workforce and acknowledges ‘radical action’ is needed to improve working conditions, boost training and retention, and become a model employer for staff. HEE said an average of 15% of nurses were leaving NHS trusts each year, with 8.7% of nurses leaving the NHS entirely between 2016-17. In contrast, there are up to 42,000 nursing, midwifery and allied health professional posts lying vacant. The research found that only 72,000 new NHS staff were expected to join the health service in the next ten years, yet it needs 190,000 new posts by 2027 to meet the needs of a growing and ageing population. HEE chief executive Ian Cummings said: ‘Continuing with a business as usual approach to workforce planning is no longer sustainable. RCN chief executive Janet Davies said the college looked forward to working with ministers to find ‘properly funded’ solutions to the crisis. Ms Davies said: ‘Recruiting more nurses is paramount, and we are concerned about the higher cost of apprenticeships – a nursing degree is still the fastest and safest route into nursing. ‘Yet student numbers are not increasing – the government must invest in student funding and take responsibility for building a sustainable domestic supply of nurses. She also said the government should reverse cuts to ‘vital’ continuing professional development funding. In a six-point recruitment plan, HEE announced strategies to ensure the supply of staff from within the UK to stop the over-reliance on staff from overseas as part of an NHS-wide consultation. It also aims to create a more ‘flexible and adaptable’ workforce through greater training so it is easier for specialist staff to work across disciplines, as well as providing greater access to flexible working patterns. Also outlined were strategies to make it easier for staff to undertake training to help them progress their careers, and a recruitment drive from ethnic minority communities. In a statement, health secretary Jeremy Hunt said: ‘NHS staff are our health service's greatest asset, but for too long, governments of all parties have taken a short-termist approach to NHS workforce planning. ‘We need a proper plan that stretches beyond any electoral cycle, and secures the supply of NHS staff for future generations. Consultation is underway and will run until March 23. It asks NHS staff to provide feedback on questions including what can be done to ensure staff at all levels see the NHS as ‘a valid and attractive career’.